This block is based on a blog comment. I thought I would get in first. again I could sell them as a beauty aid…. 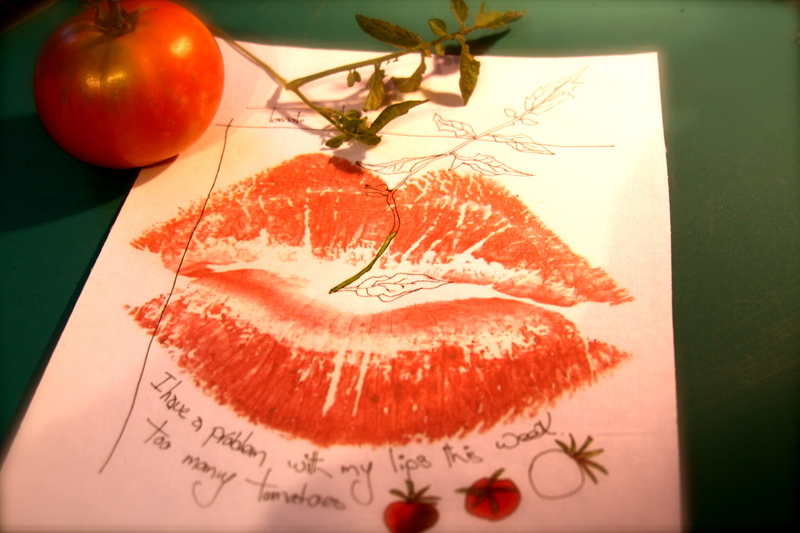 tomatoes and you could have luscious lips.!!!!" and now the block is complete. It's a little unusual for me, a little out of the ordinary…. but I needed a break from the intense quilting on the Rhino and this small quilt fitted the bill. 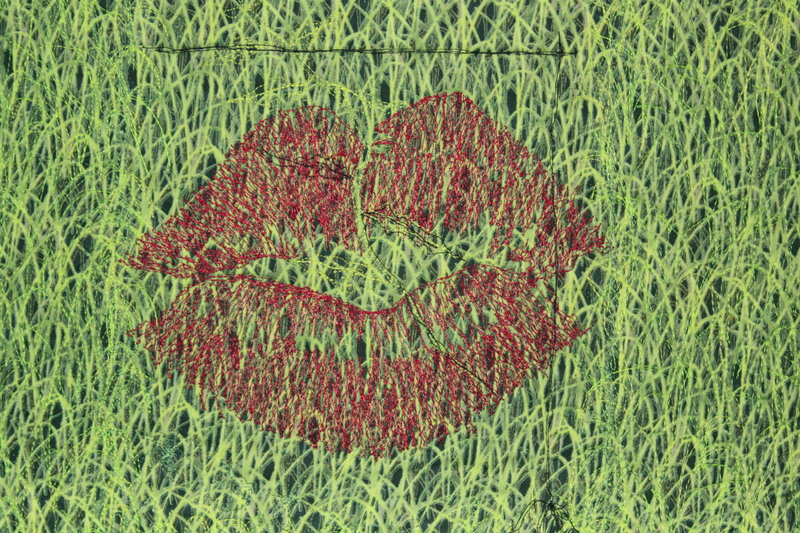 I printed the picture of the lips on a piece of good quality white cotton that I had stabilized with fusible web. But these were tomato lips and I associate my tomatoes with the green grass by the veggie patch. 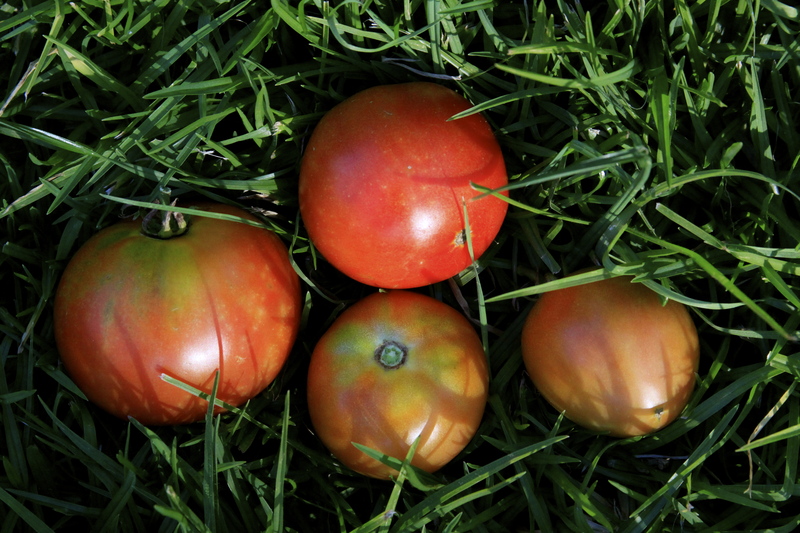 I lay the tomatoes on the grass after I've picked them…. and there you are, I had some grass fabric in my stash…. 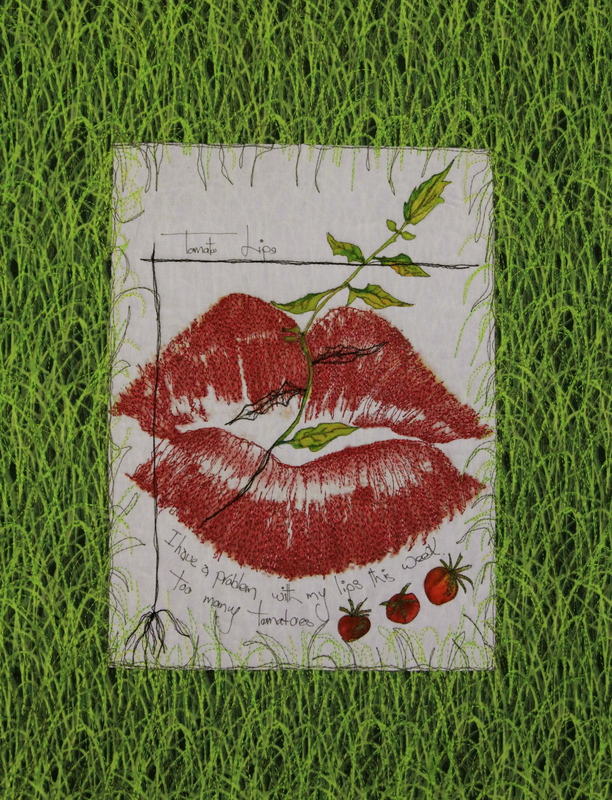 I ironed the lips image to the grass fabric and added batting and backing fabric. Beginning with the lips, and a rayon thread, I first began quilting with a straight stitch and very quickly changed to a free motion zig zag. I change the stitch to 1.5 stitch width and 1.5 stitch length, feed dogs up, free motion foot on the machine and go for it… You will the width is really set by the dial, however, the length is up to you and the speed with which you move the fabric. I then added another color and stitched with a straight stitch. Then the rest of the images… I didn't want the sprig of leaves to be heavy, so they are quilted with mono-filament thread. I added black to the line around the block and then a few outlined leaves… just for interest and it adds a 'sketched' effect. The background is quilted in 3 different green cotton threads. I followed the pattern on the fabric and added a little more interest by taking the pattern into the white of the lips block. This is a n interesting experiment because there were no drawings make prior to making the block… but it was done as If I was drawing in my sketch book right on the fabrc. You amaze me!!! I could only dream of having the talent you have and how wonderful it is that you share it with the world….not jealous, not envy, just pure love for your art! Thank you! Pamie G.
That is so cool Pam!! Great stuff. Good stuff…. I checked out your blog too… super…..
Next PostBlock No 17 completed.